An MVar is a mutable location that can be empty or contains a value, asynchronously blocking reads when empty and blocking writes when full. This data type is inspired by Control.Concurrent.MVar from Haskell, introduced in the paper Concurrent Haskell, by Simon Peyton Jones, Andrew Gordon and Sigbjorn Finne, though some details of their implementation are changed (in particular, a put on a full MVar used to error, but now merely blocks). Appropriate for building synchronization primitives and performing simple interthread communication, it’s the equivalent of a BlockingQueue(capacity = 1), except that there’s no actual thread blocking involved and it is powered by Task. MVar is generic, being built to abstract over the effect type via the Cats-Effect type classes, meaning you can use it with Monix’s Task just as well as with cats.effect.IO or any data types implementing Async or Concurrent. 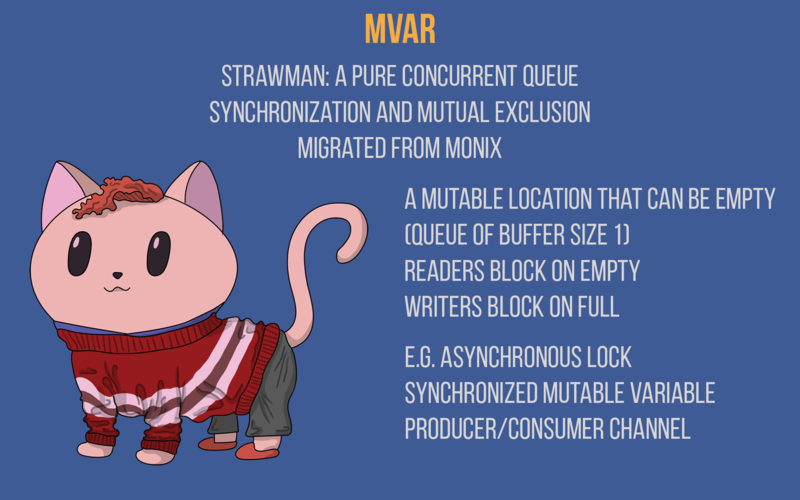 Note that MVar is already described in cats.effect.concurrent.MVar and Monix’s implementation does in fact implement that interface. This sample isn’t very useful, except to show how MVar can be used as a variable. The take and put operations are atomic. The take call will (asynchronously) block if there isn’t a value available, whereas the call to put blocks if the MVar already has a value in it waiting to be consumed. Obviously after the call for take and before the call for put happens we could have concurrent logic that can update the same variable. While the two operations are atomic by themselves, a combination of them isn’t atomic (i.e. atomic operations don’t compose), therefore if we want this sample to be safe, then we need extra synchronization. An obvious use-case is to model a simple producer-consumer channel. Say that you have a producer that needs to push events. But we also need some back-pressure, so we need to wait on the consumer to consume the last event before being able to generate a new event. ch.put(None) // we are done! Task.now(sum) // we are done! Running this will work as expected. Our producer pushes values into our MVar and our consumer will consume all of those values.